Expert annotations for this species! See below. The spiny-tailed lizard, Uromastyx, is traditionally placed in the iguanian group Agamidae, although -- with Leiolepis -- it is generally acknowledged to be a basal taxon. Uromastyx is a desert lizard found in both rocky and sandy terrains from North Africa (Morocco to Mauritania, across to Egypt and the Sudan) and the Middle East (the Arabian Peninsula, Iran, Iraq) to India, Afghanistan and Pakistan. Some 13 species are currently recognised, of which U. aegyptis (Egypt), U. acanthinurus (Morocco), and U. hardwickii (India, Pakistan) may be among the more familiar. The fossil record is not extensive but Uromastyx has been reported from the Eocene of Europe (Auge, 1988), demonstrating a more extensive original range. Adults vary in size, but can reach at least half a metre in total length. They create large spiral burrows using powerful claws. Uromastyx is omnivorous, but while the young feed predominantly on invertebrates, adults incorporate a high degree of plant material into their diet. The skull of Uromastyx shows the following features typical of agamid lizards: reduced single premaxilla; strong anterior maxillary contact behind the premaxilla; single frontal and parietal with wide frontoparietal suture; strong preorbital pillar (prefrontal-palatine contact); palate palaeochoanate (i.e. without separation of the vomeronasal opening from the choana); and braincase exposed in dorsal view. Siebenrock (1895) recognised two major skull types amongst agamids: the first, laterally compressed, is found mostly in arboreal genera; the second, wider and flattened, occurs mainly in terrestrial taxa like Uromastyx. Like all agamids, and also chameleons, Uromastyx is characterised by acrodont teeth (triangular blades fused to the jaw margins). In the premaxilla, the central tooth is hypertrophied and is flanked by much smaller denticles. In the dentary there is a single pleurodont tooth, separated from the remainder by a small diastema. The teeth occlude precisely like the blades of pinking shears, resulting in effective orthal shear and precisely delimited wear facets (most easily seen in the 'Yaw' animation above). The bite is particularly powerful in Uromastyx, thanks to a large and complex pterygoideus muscle running from the palatal region onto a tendinous sheet lateral to the rear of the lower jaw (Haas, 1973). Throckmorton (1976) found no evidence of mesokinesis in Uromastyx, but the potential for streptostyly may be stronger (although Herrel et al., 1998, reported that they could not confirm this). Click on the thumbnails below for a detailed description of the skull in standard anatomical views. Click on the thumbnails below for a description of internal features of the skull based on cutaway views. This dry skull resides in the University College Anatomy Collection, University College London. No locality information is known. It was made available for scanning by Dr. Susan Evans of University College London. Funding for scanning and image processing was provided by a National Science Foundation Digital Libraries Initiative grant to Dr. Timothy Rowe of The University of Texas at Austin. This specimen was scanned by Matthew Colbert on 24 July 2003 along the horizontal axis for a total of 486 slices. Each slice is 0.0588 mm thick, with an interslice spacing of 0.0588 mm and a field of reconstruction of 55 mm. The mandibles were affixed to the skull with wax; this appears as dark gray material at the anterior end of the lower jaw and on the mandibular condyles of the quadrates. Auge, M. 1988. Revision du lezard Uromastix europeaus (Reptilia, Lacertilia) de l’Oligocene français. Analyse fontionelle de l’appareil masticateur de genre Uromastix et implications paleoecologiques. Revue Paléobiology 7:317-325. Beddard, F. E. 1905a. Some notes on the cranial osteology of the mastigure lizard, Uromastix. Proceedings of the Zoological Society of London 1905:2-9. Beddard, F. E. 1905b. A contribution to the anatomy of the frilled lizard, Chlamydosaurus kingi and some other Agamidae. Proceedings of the Zoological Society of London 1905:9-22.
Cooper, J. S., and D. F. G. Poole. 1973. The dentition and dental tissues of the agamid lizard Uromastyx. Journal of Zoology (London) 169:85-100. El-Toubi, M. R. 1945. Notes on the cranial osteology of Uromastyx aegyptia (Forskål). Bulletin of the Faculty of Science Cairo Faud 1 University 25:1-10. El-Toubi, M. R. 1947. Some observations of the osteology of the lizard Agama stellio (Linn). Journal of Morphology 81:135-150. Estes, R. 1983. Sauria terrestria, Amphisbaenia. Handbuch der Paläoherpetologie (Encyclopedia of Paleoherpetology) (P. Wellnhofer, ed.). Gustav Fischer Verlag, Stuttgart and New York, part 10A, 249 pp. Estes, R., K. de Queiroz, and J. Gauthier. 1988. Phylogenetic relationships within Squamata, p. 119-281. In Phylogenetic relationships of the lizard families: Essays commemorating Charles L. Camp (R. Estes and G. Pregill, eds). Stanford University Press, Stanford. Frost, D. R., and R. Etheridge. 1989. A phylogenetic analysis and taxonomy of iguanian lizards (Reptilia: Squamata). University of Kansas Museum of Natural History Miscellaneous Publication 81:1-65. Frost, D., R. Etheridge, D. Janies, and T. Titus. 2001. Total evidence, sequence alignment, evolution of polychrotid lizards, and a reclassification of the Iguania (Squamata: Iguania). American Museum Novitates 3343:1-38. George, J. C. 1955. On the cranial osteology of Uromastix hardwickii (Gray). Journal of Animal Morphology and Physiology 1:23-29. Gnanamuthu, C. P. 1937. Comparative study of the hyoid and tongue of some typical genera of reptiles. Proceedings of the Zoological Society of London B 107:1-63. Haas, G. 1973. Muscles of the jaws and associated structures in the Rhynchocephalia and Squamata, p. 285-490. In Biology of the Reptilia volume 4 (C. Gans and T. S. Parsons, eds.). Academic Press, New York and London. Herrel, A., P. Aerts, and F. De Vree. 1998. Static biting in lizards: functional morphology of the temporal ligaments. Journal of Zoology (London) 244:135-143. Herrel, A., P. Aerts, J. Fret, and F. De Vree. 1999. Morphology of the feeding system in agamid lizards: ecological correlates. Anatomical Record 254:496-507. Islam, A. 1955. 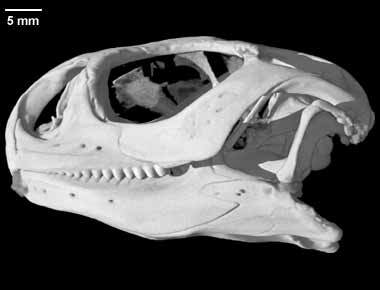 The skull of Uromastix hardwickii Gray. Biologia (Lahore) 1:141-196. Kaur, D. 1973. Structure of the bony palate in some Indian reptiles. Annals of Zoology 9:57-94. Moody, S. M. 1980. Phylogenetic and historical biogeographical relationships of the genera in the family Agamidae (Reptilia: Lacertilia). Ph.D dissertation, University of Michigan, Ann Arbor. Robinson, P. L. 1976. How Sphenodon and Uromastyx grow their teeth and use them, p. 43-64. In Morphology and Biology of Reptiles (A. d'A. Bellairs and C. B. Cox, eds). Linnean Society Symposium Series No. 3, Academic Press, London. Saksena, R. D. 1942. The bony palate of Uromastix Merrem. Proceedings of the Indian Academy of Sciences B 16:107-119. Siebenrock, F. 1895. Das Skelet der Agamidae. Sitzungberichte der Kaiserlichen Akademie der Wissenschaften Mathematisch-Naturwissenschaftliche Klasse in Wien 104:1089-1196. Sondhi, K. C. 1958. The hyoid and associated structures in some Indian reptiles. Annals of Zoology (Agra) 2:155-240. Throckmorton, G. S. 1976. Oral food processing in two herbivorous lizards, Iguana iguana (Iguanidae) and Uromastix aegyptius (Agamidae). Journal of Morphology 148:363-390. Throckmorton, G. S. 1979. The effect of wear on the cheek teeth and associated dental tissues of the lizard Uromastix aegyptius (Agamidae). Journal of Morphology 160:195-208. Throckmorton, G. S. 1980. The chewing cycle in the herbivorous lizard Uromastix aegypticus (Agamidae). Archives of Oral Biology 25:225-233. To cite this page: Dr. Susan Evans, 2003, "Uromastyx hardwickii" (On-line), Digital Morphology. Accessed April 19, 2019 at http://digimorph.org/specimens/Uromastyx_hardwickii/.